Bali Pre-wedding photos of a different kind!!! We want others to say ‘wow’ when they see our Bali pre-wedding photos. Are we on the same page here ? I hear you scream: YES! Now the problem is if you browse the internet or see what your married friends have done you will realize that everyone’s pre-wedding photos are pretty much the same. The man-hugs-woman-from-the-back shot, the looking-into-the-distance-together shot, the photographer-creepily-takes-a-photo-from-behind-a-bush shot, …. Yawn… C’mon we’ve seen it all already. If this is what you want, you do not need to read on. But if you want your Bali pre-wedding photos to be truly spectacular I am going to show you how to have photos that will make everyone say: WOW ! Why not such spectacular photos as your honeymoon photographs or on the occasion of a wedding anniversary. So what on earth am I talking about ? What’s the secret to having truly spectacular pre-wedding photographs? 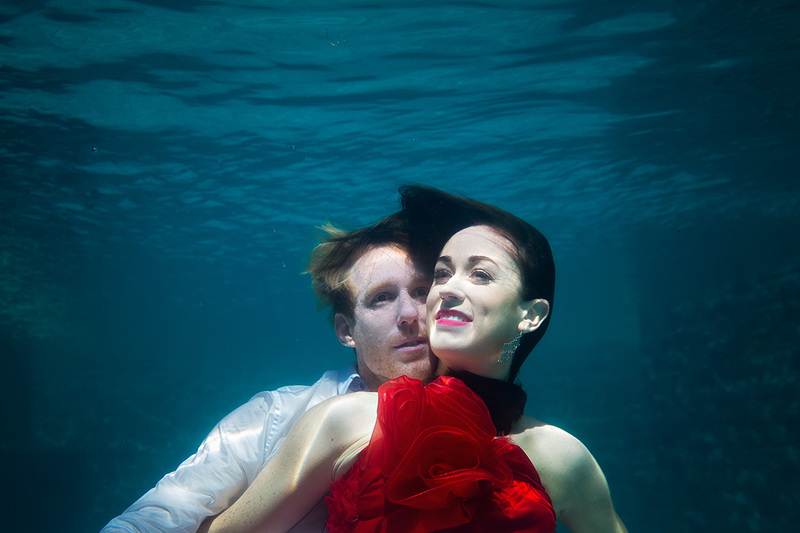 Underwater pre-wedding photos displayed at your wedding will beat photos shot at the most exotic locations. Why not explore a whole new world instead. And the good news is it won’t break your bank. 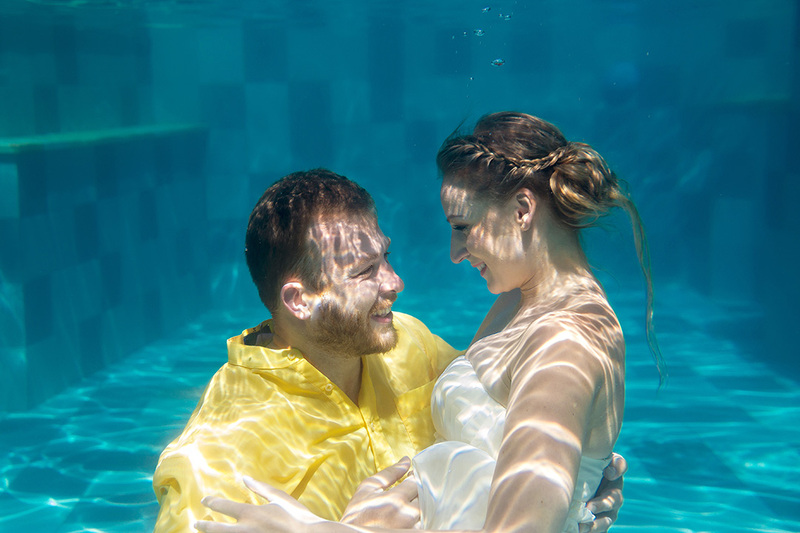 I am sure that after you have seen some of the Bali underwater pre-wedding photographs I don’t need to convince you further how great such photos look. Therefore, I will rather focus in the following on explaining to you how you can get such spectacular underwater photos here in Bali. Pulling off an underwater shoot isn’t as difficult as you may think. If you’ve seen photos of models posing on a shipwreck in the open ocean, then yes, that is difficult (and those models are professional free-divers with a crew of 8 safety divers around by the way). In other words: Better forget this kind of photos unless you are a seasoned diver and you have a budget in excess of 15k USD. Also, the oceans around Bali have dangerous under currents and the water clarity on most days is not sufficient for such kind of underwater photos. There are some spectacular ocean locations in Mexico and throughout the Carribean. But we don’t wanna travel that far, do we ? So now that we have that out of the way let’s see how and where you can get great Bali underwater photographs. Not only will you be getting pretty, out-of-the-world photos, an underwater photo shoot in Bali is fun and an authentic experience in itself! You’d also be able to save plenty of time as the whole shoot will take only 3-4 hours (inclusive of time for make-up). After which, you can enjoy the rest of your precious time in Bali for holiday. I am in ! What do I need ? Primarily, what is required is an ideal pool. If you think that any pool at a hotel or a private villa will do, think again. Do you want the feet of other swimmers dangling in the background of your photos? Or playing children bump into you while you do your underwater photos ? So, the pool where you will do your Bali underwater photos should be private and exclusively available to you during the shoot. As mentioned previously the pool will need to have a minimum depth of 1.6 meters. Better a bit more. It should also be at least 8 meters long because your underwater photographer needs to have enough distance to you so that he can choose the best angles. The water needs to be very clear ? Probably the most important aspect is that the water of the pool is super clear. Most pools in hotels do not offer this. That does not mean that those hotel pools are not clean. What may look as a perfectly clean pool to you will not have the water clarity that is required for underwater photos. But you don’t need to worry too much about this. Your Bali underwater photographer will know where and in which pool you can find the conditions necessary for a great underwater photo shoot. Your photographer will guide you throughout the shoot and he will show you how to pose. He will also show you a few tricks about you special breathing techniques. This will enable you to stay underwater for a good 10-15 seconds, comfortably. Underwater photography is perfectly safe ! If you are concerned about safety, don’t worry! As long as you work with an experienced underwater photographer nothing can happen. I can assure you it is perfectly safe. Any good and responsible underwater photographer will always have a team on hand should you require any assistance. One important thing before I forget: You both must be able to swim. There is no way around this. Your photographer will show you the right breathing techniques. And once you are comfortable, the shoot will move slowly towards in the deeper end of the pool. What else you need to pay attention to? There are a few more aspects that you need to pay attention to. And in the following, we will explore those. This is a very important aspect in an underwater shoot as the beauty of an underwater shoot is capturing the flow and dynamics of being underwater. The dress you choose has to be flowy! The more 'poofy' the dress, the better! The more adventurous among you may also do part of the shoot without clothing at all! What colours to wear ? Colours matter a lot ! Colours are what makes you photos pop! You definitely want to avoid dresses with a blue tone. Because many swimming pools have blue tiles and you wouldn’t want to blend-in with the pool! The best colours are vibrant colours! Think pink, yellow, red, purple, peach – warm colors that contrast with the cool hues of the water and the pool. I also do not recommend a white wedding gown. But if you choose a wedding dress then make sure it is one with lot’s of texture. Something with laces and some pearls or something that shines and glitters. Your underwater photographer should have a makeup artist included in the package. A makeup artist who is experienced with makeup for underwater. Because underwater makeup requires water-proof cosmetics. And also, makeup for underwater is slightly different from the makeup style used in a conventional photoshoot. So better go with the makeup artist your photographer suggests rather than bringing in your own one. Or god forbid you choose one of the countless wanna-be stylists in Bali. There is one makeup agency though who I can point out and recommend in case your photographer’s package does not include makeup services. Do I need to know how to dive to do this shoot? NO ! You do not need to be a diver to do an underwater shoot. Anyone how knows how to swim can do it. You will not need to use an oxygen tank during the shoot. All you have to do is stay underwater for as long as you feel comfortable holding your breath. Usually 10 – 15 seconds. With the special breathing techniques your photographer shows you, you’d definitely be able to last more than 10 seconds! 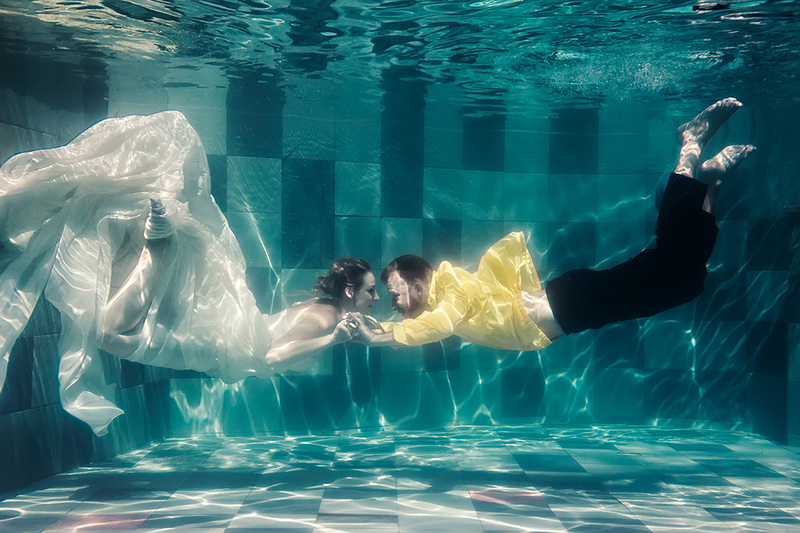 Props can add another dimension to your underwater shoot. Flowers can look amazing. Hats and caps look nice too, but are difficult to wear underwater. Your underwater photographer may have other tricks up his sleeve. Though in my opinion props are not necessary because underwater photos are already pretty spectacular on their own. So who is your best choice for such gorgeous underwater photos in Bali ? Until now is was hard to find a good underwater photographer in Bali. Some have offered this services, but cheaply done and with questionable quality. But that has changed! Dominik also happens to be one of Bali's most distinguished wedding and pre-wedding photographers. He can also offer you packages that combine underwater photography as well as spectacular pre-wedding photographs in Bali's most scenic location. One thing though. DOMINIK only acceptes few bookings to maintain the highest possible quality of his services. So make sure to book your underwater photoshoot in Bali soon. Click the button below to make your inquiry. I hope I have wetted your taste buds for an underwater photoshoot in Bali. At least, now you know everything you need to on how to have spectacular underwater photos during your holiday in Bali.